After dismissal from VHP, Dr Pravin Togadia plans indefinite sit in fast for Hindutva from today. Upananda Brahmachari | Karnavati (Ahmadabad) | HENB | April 14, 2018:: Dr. Pravin Togadia, who has been with the Vishwa Hindu Parishad for over three decades, on Saturday announced he was quitting the outfit and said he would go on an indefinite fast from Tuesday to fight for the Hindutva cause. The veteran Hindutva leader, who served as the VHP international working president since December 2011, announced his decision in a press conference after his nominee to the post of international president of the VHP was defeated in voting, which were the VHP’s first elections in over five decades. “I am not in the VHP anymore. I was in it for 32 years. For the welfare of Hindus, I left my home and my lucrative medical practice. I will continue to work for the welfare of Hindus. Hindus first is the mission of my life and from Tuesday, I will go on an indefinite fast in Ahmadabad for fulfilling the long-standing demands of Hindus,” he said. 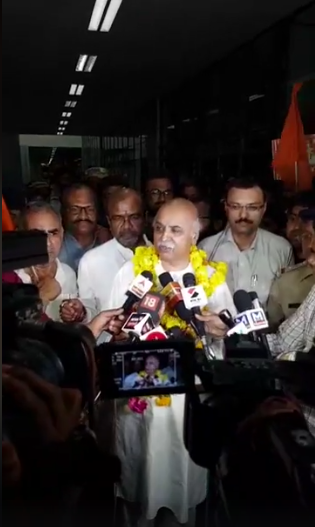 On Saturday late night, Dr Togadia reached Ahmadabad Airport, where he was greeted by thousands of his supporters. In a press meet in the Ahmadabad Airport, Dr Togadia went against various anti-Hindu stands adopted by PM Narendra Modi and the breach of promises made to Hindus by BJP in their election campaigning. Dr. Togadia announced that his demand for a Central Ordinance for the construction of Ram Temple in Ayodhya would be the key point for his movement, along with other Hindu demands like ‘Law for Banning Cow Slaughter’, ‘Rehabilitation of Kashmir Hindus’, ‘Abolition of Art. 370’, ‘Enactment of Uniform Civil Code’, ‘Waiving out the Loan for Farmers’ and ‘Free Education and Employments for all Hindus’. Anti Togadia Front in RSS-BJP-VHP set former Himachal Pradesh governor V.S. Kokje in the VHP presidential election, who was elected as the VHP’s international president on Saturday. Kokje got 131 votes and defeated incumbent Raghava Reddy who mustered 60 votes. For the election, which was held in Gurugram, 192 delegates of the VHP were eligible to vote. Togadia, who batted for Reddy, however, alleged irregularities in the exercise. Togadia has of late been critical of Prime Minister Narendra Modi and the BJP leadership. Nearly two weeks ago, Togadia claimed an ‘undeclared emergency’ existed in the country after the government announced plans to modify guidelines for accreditation of journalists, which were hastily dropped. Togadia was considered to be an ally of Narendra Modi before the latter became chief minister of Gujarat, though the duo later fell out. Dismissal of Dr Togadia out of an conspiracy hatched by RSS-BJP, created an anger of thousand of VHP and Bajrang Dal activists through out India. In Junagarh, all the Bajrang Dal leaders and activists resigned from their portfolios as reported. Thousands of VHP and Bajrang Dal activists are likely to join the indefinite fasting of Dr Togadia to be started from 10 PM today at 2 Banikar Bhawan, Mahalakshi Society, in front of Mahalakshi Temple, Paldi, Karnavati (Ahmadabad). As per latest input, Gujarat Govt is not giving permission for the fasting programme of Dr Togadia. This entry was posted on April 17, 2018 by hinduexistence in Anti-Hindu, Attack upon Hindu Sentiment, BJP menace, BJP Menace on Hindu Matters, Conspiracy against Hindus, Demand for Cow Protection, Demand for Ram Temple at Ayodhya, Demand of Common Civil Code in India, Hindu Advocacy, Hindu Leadership, Hindu Leadership Under Attack, Hindu Protest, Hindu Retaliation and tagged Deamand for Ram Temple Construction in Ayodhya, Dr Pravin Togadia plans indefinite fasting for Hindutva, Dr Togadia in Ahmadabad Fasting, Togadia's dismissal from VHP.